Someone found any solution to this except keeping to version 0.81? The code now works for the latest Home Assistant. Have you pulled the latest code from github? Sorry, no I hadn’t, but now I have and that did work very well. Thanks! This seems really interesting, but I think I must be doing something wrong. I keep getting the following error every minute. I’ve tried to read the source code on https://github.com/mgejke/hass-sectoralarm/blob/master/sector_alarm.py, but can’t seem to figure out what is causing the problem. It might be the login, but a login error is supposed to throw a different message, so I’m guessing I managed to log in correctly. Does anyone have an idea as to what I might be doing wrong? I have a problem with disarming through automations. The log says " Invalid code given". I am sure I use the right code. It is possible to disarm the alarm through the frontend with the given code. I have tried formating the code in different ways with no success. Non of the above works. I want to disarm the alarm when my vacuum robot is vacuuming the house. 2019-01-08 08:19:58 ERROR (MainThread) [homeassistant.setup] Setup failed for sector_alarm: Component failed to initialize. This problem should be solved in the files available on github. When you update the files in custom components folder, make sure to download the latest version from the git repository and update all files. There are files in subfolders as well (like sensors/ etc). Thank you @endor for your reply! I have a copy of all my config here: https://github.com/corvy/home-hassio and I cannot find the “PLATFORM_SCHEMA” in any file in my custom_components subdirs. If you could have a look I would be very happy! And just to be perfectly clear I just installed all fresh from git just two days ago due to a total data loss on my old solution. So there should be no old config or datafiles lingering. The configuration.yaml looks correct. and if it works on reboot it should not be any content issues. I have also secrets in use. All secrets regardless of format are in double qoutes in the secrets file. and my code is defined as opposed to yours is commented out… although with dummy code in secrets. Nah, still fails even with hard boot. Not sure what is wrong. Not sure I have a verified test since I reinstalled. Any way to turn on debugging of the component? The logs give me nada as-is. Just got an email from Sector that they have locked my account Seems they have gotten some error on logins. When I unlocked it now it all works! 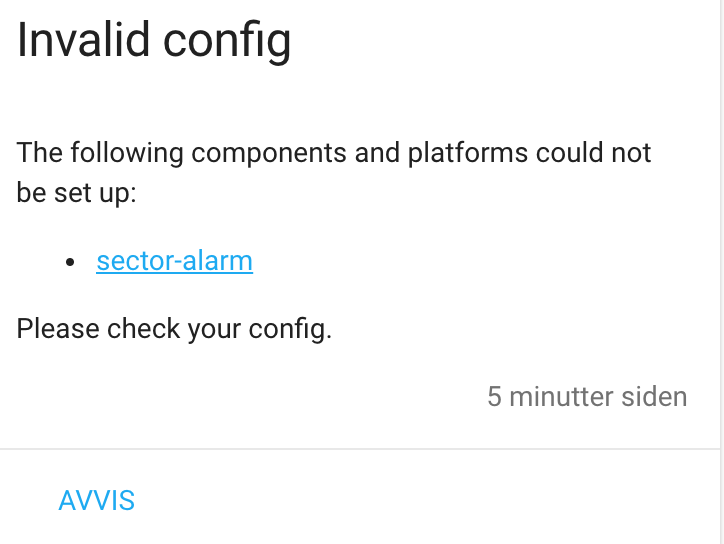 2019-01-15 16:06:46 WARNING (MainThread) [homeassistant.setup] Setup of sector_alarm is taking over 10 seconds. I’m using this custom component and it’s working almost flawlessly, I have the random “can’t start sector” but a restart normally sorts it out. So thank you! I’m been trying to find out if there is a way to add triggering the alarm. “trygghetslarm” or “panic mode” basically a mode for when your not feeling safe . say someone is trying to break in during the night. the basic alarm trigger. from a motion sensor or door sensor etc. But, neither of these modes are possible to trigger via the app or webpage. Does anyone know if it’s exposed through commands even though you cant see it in the app or on the homepage? So, after 0.88.1 upgrade sector broke for me. It times out when starting, similar to @tomoqv error message. Not sure if it is due to that my sd-card is slow or why it times out, but removing the timeout completely works in my setup, verify if it works for you and then we can propose to have it removed as default in git and the module? changed 300 files with 255 additions and 517 deletions.